I recently became a member of a CSA (community supported agriculture) project with Full Belly Farms. Every week you receive a box of fresh, organic fruits and veggies and in turn you are supporting local farmers. My first produce box came this week and I was so excited! I didn’t know what the box contained and after picking it up at the farmer’s market I rushed home to see what was inside. 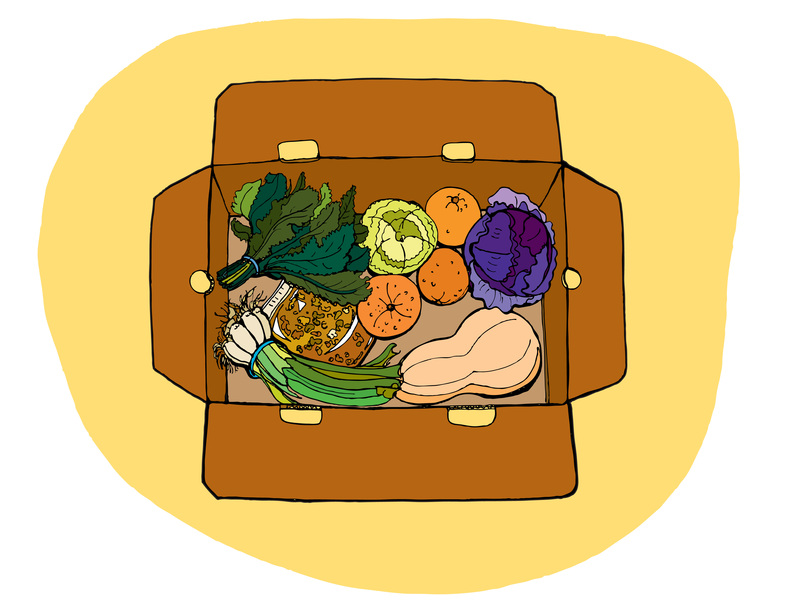 This week’s box contained butternut squash, celery root, leeks, red russian kale, oranges, cabbage, and walnuts. I couldn’t be more pleased. It was a great mix of old favorites and new (to me) veggies. I have to say, I’m hooked. The produce is delicious, it mixes up my diet, and you get that tingly (and slightly self-righteous) I-just-did-good-for-the-earth feeling for eating organic and local. I’ve already dug in and ate much of what the box contained. So far, my favorite thing was the red russian kale. I cooked it with leeks, walnuts, and some golden raisins I had in the pantry. It was a delicious blend of sweet and savory. Here is the recipe in case you want to try it for yourself. Chop the the kale stems, garlic and leeks and sauté in 1 tbs. of olive oil for 5 minutes. Add the walnuts and raisins and cook for a few more minutes. Reduce heat and add the leaves of the kale and a few tablespoons of water and the remaining tablespoon of olive oil. Cover and steam for about five minutes. Stir, cover, and repeat until the leaves are tender but not mushy. I hope you enjoy it as much as I did. By the way, if anyone out there has a good recipe for celery root or butternut squash, please let me know! This is the first opportunity I’ve had to cook celery root and I only have limited experience cooking with butternut squash, so I need some ideas. Be well and have a wonderful weekend! I just came across your blog via twitter…your illustrations are just gorgeous & so unique! In recognition of that please head over to Toast where I have left you a little award.